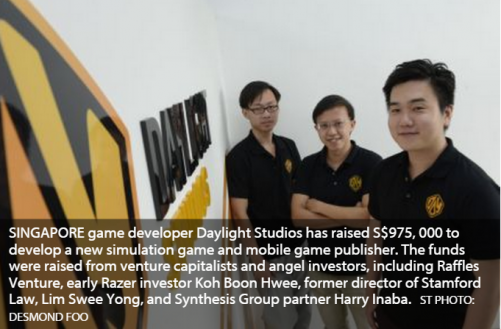 SINGAPORE game developer Daylight Studios has raised S$975, 000 to develop a new simulation game and mobile game publisher. The funds were raised from venture capitalists and angel investors, including Raffles Venture, early Razer investor Koh Boon Hwee, former director of Stamford Law, Lim Swee Yong, and Synthesis Group partner Harry Inaba. Fans of role-playing games (RPGs) will have something to look forward to as Daylight Studios rolls out its latest game titled Holy Potatoes! A Weapon Shop?!. The new simulation game will allow players to forge their own virtual weapons and deploy manpower in the form of potato smiths to "grow their businesses in twenty wacky areas", according to the developer. This is Daylight Studio's first game for the personal computer, and the fifth that it has developed thus far. It previously created puzzle adventure game Spirit Horizon, RPG Reign of Heroes Turbo and Swords of Fate, and Hisho Collection Mall Empire with game developer Konami. Hot Potatoes! has successfully completed the Steam Gamelight process, whereby developers can put up their game concepts on Steam, and community users vote to determine if a game can be sold on the platform. "Holy Potatoes! is a look at a RPG from the other side," said CEO and executive producer at Daylight Studios, Don Sim. The funding will also help set up mobile game publisher Quest Drop, a subsidiary of Daylight Studios. Quest Drop offers localised art, animation, advertising and marketing services. It also helps customers measure a game's potential with pre-launch testing; consultation on potential retention and monetisation problems of a game; and offers localisation services and quality assurance through localisation partner Synthesis. This is Daylight Studios' third funding round since its inception in May 2011, and marks the company's Series A round. Its new game will be launched this summer. Quest Drop (Thailand) Limited, a subsidiary of Quest Drop, is also poised to be set up in Bangkok in the coming months.